It is that time of year when I'm starting to do my shopping for Yule. I like to wait until after Samhain, but I also like to get my card and gift buying done before the last-minute rush. 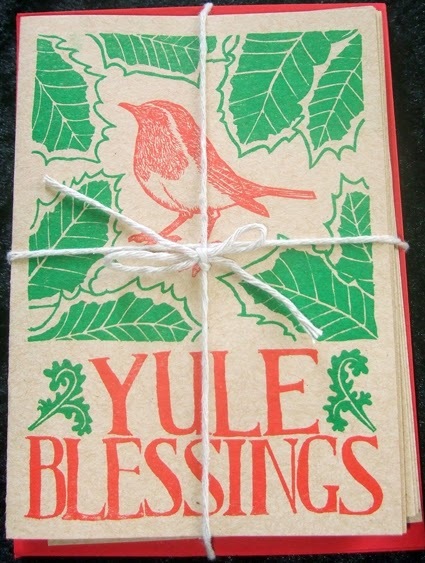 When it comes to cards, I prefer to buy ones that don't say "Happy Christmas", because being pagan I call the midwinter festival Yule or the Winter Solstice. Charged by Fire says: "I’m a pagan on a mostly-solitary path, living in beautiful South Wales. "I have studied art and writing. I paint the images I am given in dreams and shamanic journeys and meditations. I am determined that people should have access to my work no matter what the depth of their pockets. At one end of the scale I provide my paintings as originals on canvas – more expensive as I honour the time and care and materials involved in their creation. The work is also available as high-quality postcards and greetings cards." All the cards are on 100% post-consumer-waste recycled stock bought from a paper co-operative, while the envelopes are purchased from a company dedicated to eco-friendly stationery and the ink is vegetable oil based, not mineral oil based. Understandably, these cards are a little more expensive than ones you could buy mass-produced, but it is good to know you are supporting a UK-based small business with sound ethical principles. 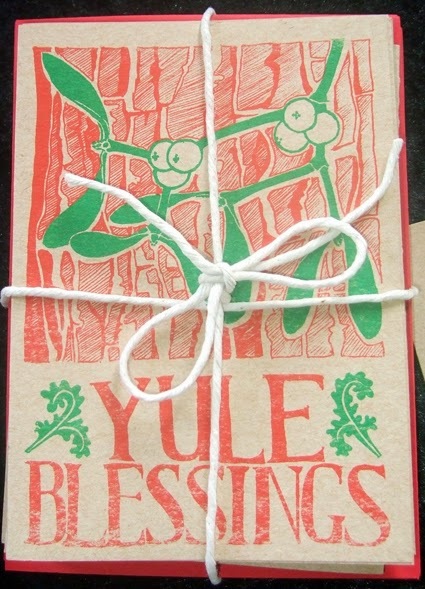 A pack of 10 Yule cards costs £15 and single cards cost £2.50. There are other designs available on the website. Over the next few weeks I will be featuring other small pagan businesses that produce suitable gifts for giving at the Winter Solstice. If you are a small UK-based pagan business that makes or sells lovely things and would like a mention, do email me a press release about your products and a photo to badwitch1234@gmail.com. Make sure you send me the details of your website, contact email and where people can buy your stuff. I can't absolutely guarantee I'll be able to post on my blog everything I'm sent, but I'll try to do my best. Well, what a lovely surprise! Thank you so much for featuring my cards. I am over the moon!